Where is the Cozad-Bates House?? 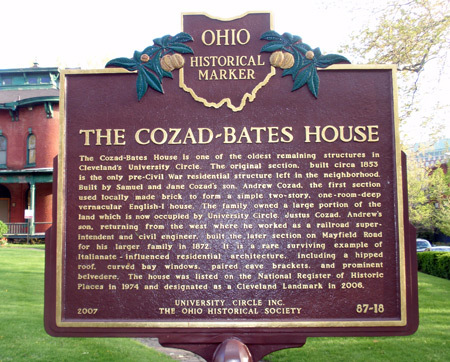 The Cozad-Bates House is one of the oldest remaining structures in Cleveland's University Circle. The original section, built circa 1853, is the only pre-Civil War residential structure left in the neighborhood. Built by Samuel and Jane Cozad's son, Andrew Cozad, the first section used locally made brick to form a simple two-story, one-room-deep, vernacular English-I house. The family owned a large portion of the land which is now occupied by University Circle. Justus Cozad, Andrew's son, returning from the west where he worked as a railroad superintendent and civil engineer, built the later section on Mayfield Road for his larger family in 1872. It is a rare surviving example of Italianate-influenced residential architecture, including a hipped roof, curved bay windows, paired eave brackets, and prominent belvedere. 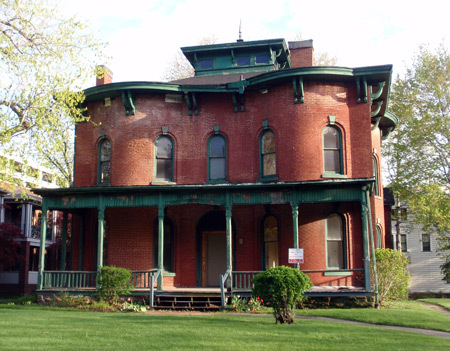 The house was listed on the National Register of Historic Places in 1974 and designated as a Cleveland Landmark in 2006. 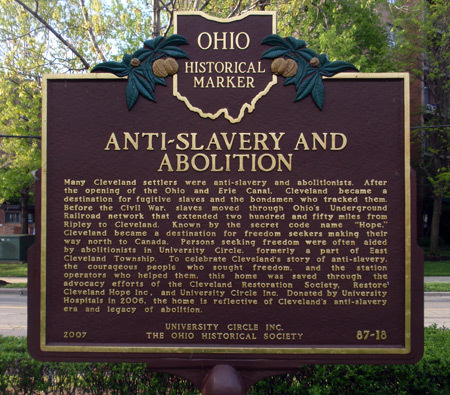 Many Cleveland settlers were anti-slavery and abolitionists. After the opening of the Ohio and Erie Canal, Cleveland became a destination for fugitive slaves and the bondsmen who tracked them. Before the Civil War, slaves moved through Ohio's Underground Railroad network that extended two hundred and fifty miles from Ripley to Cleveland. Known by the secret code name "Hope," Cleveland became a destination for freedom seekers making their way north to Canada. Persons seeking freedom were often aided by abolitionists in University Circle, formerly a part of East Cleveland Township. To celebrate Cleveland's story of antislavery, the courageous people who sought freedom, and the station operators who helped them, this home was saved through the advocacy efforts of the Cleveland Restoration Society, Restore Cleveland Hope Inc., and University Circle Inc. Donated by University Hospitals in 2006, the home is reflective of Cleveland's anti-slavery era and legacy of abolition. 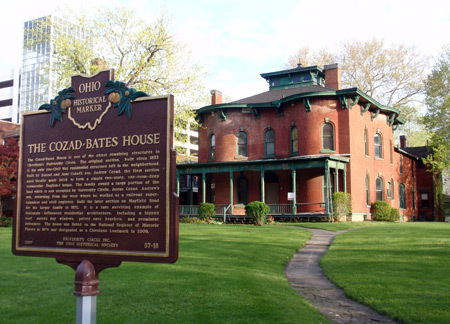 The Cozad-Bates House is at the corner of East 115th and Mayfield Rd. 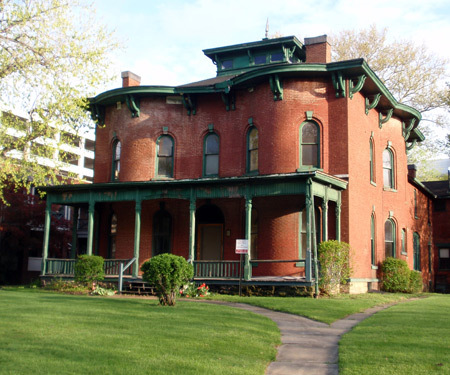 Since its founding in 2003, Restore Cleveland Hope, Inc. has worked passionately to save the Cozad-Bates House. On April 7, 2006, University Hospitals graciously donated the house to University Circle, Inc. Restore Cleveland Hope, Inc. grew out of IN THEIR PATH 2003, a 519-mile Underground Railroad walk and has expanded into a community organization that presents educational workshops and intergenerational programs. Now, RCH moves forward to establish an Underground Railroad Education and Resource Center in the Cozad-Bates House, the only pre-Civil War house still standing in the University Circle area. 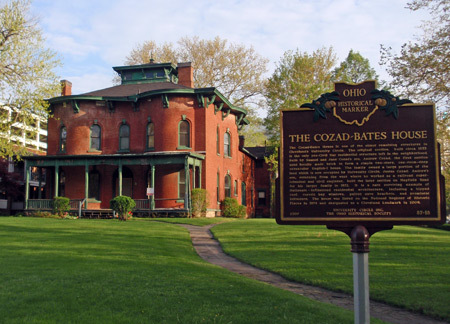 On May 30, 2009, 80-year-old Joan Southgate "completed the circle" by walking 250 miles from St. Catharines, Canada, to Cleveland's Cozad-Bates' house to raise money for RCH programming and for restoring this grand house.